Immigrant Advocates Urge Bus Company to Block Federal Agents - Integration Through Media ....! MIAMI (AP): Immigrant rights attorneys are urging a major bus company to stop letting federal agents on board to conduct immigration sweeps. 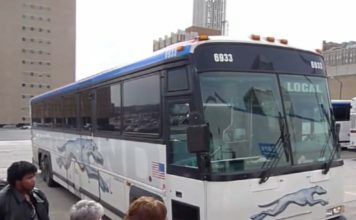 The American Civil Liberties Union’s affiliates in 10 states sent a letter Wednesday to officials for the Greyhound bus company asking them to deny agents permission to board without a warrant or on the U.S. border. The lawyers say U.S. Customs and Border Protection has been searching buses more often to check the immigration status of travelers, singling out people based on race or their appearance. Border Patrol has the power to operate immigration checkpoints and conduct other activities within 100 miles (160 kilometers) of a U.S. land or coastal border according to a federal law. But the letter says the statutes cannot override the Fourth Amendment, which protects people and businesses against illegal search and seizures. The advocates say the checks have taken place in at least seven states including California, Florida and Vermont. Last month, advocates in Florida warned immigrants about the checks when traveling to the state. Greyhound spokeswoman Lanesha Gipson said in a statement the company cooperates with law enforcement agencies.